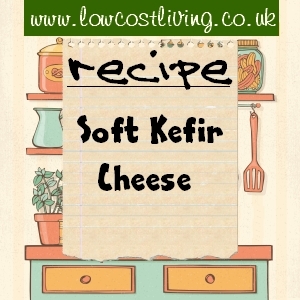 In order to make a kefir soft cheese you first need to make kefir. Check out our guide on making kefir at home – it is super simple and even if you decide not to make cheese with it, you will find so many tasty benefits of having this ferment on the go. Although you could use store bought kefir for this, it doesn’t work as well. The probiotic benefit is not as great and often it is not as thick as home made. The home made kefir for this cheese can be made with pasteurised or raw milk, but not UHT. This is so simple! Once your kefir is thickened and fully fermented drain the kefir as normal. You’ll want at least 500ml of kefir ideally, although you can of course make smaller batches, but the yield tends to be about 200-250g soft cheese for 500ml kefir. Then, put the muslin or coffee filter inside your sieve and pour in the kefir. Cover (or tie the top of the muslin) and leave in the fridge for 12-18hrs to strain. The longer you strain the firmer your soft cheese will be. Once strained the kefir cheese is ready to be flavoured. It has a delicious tang on its own, and quite often I have it just as it comes smoothered on a piece of sourdough toast. Garlic & Herb – one clove of garlic very finely crushed or diced, a pinch of dried mixed herbs, and a pinch of salt, all mixed in to 200g of kefir cheese. Honey – for this I don’t mix the honey but drizzle over the kefir cheese. It is a delicious mix of sweet and tangy. Chilli – when growing chili peppers we always have far too many each year and dry some out for the Winter stores. I take one dried chili and crush it with the pestle and mortar. I add this and a pinch of salt to 200g of soft cheese for a warming kick. One mistake people make when making cheese, yoghurt, or other home dairy, is to discard the whey. This however is a mistake as the whey can have so many uses. It is great for baking and also can be used for short ferments of vegetables. We try to use every last bit of the food we make as it not only saves us money, but is more environmentally sound too.